Since the Renaissance, art in Belgium and the Netherlands has been known for its innovations in realistic representation and its fluency in symbolism. 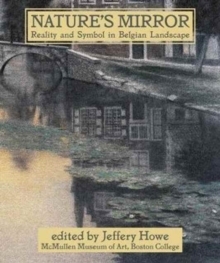 New market forces and artistic concerns fueled the development of landscape as an independent genre in Belgium in the sixteenth century, and landscape emerged as a major focus for nineteenth-century realist and symbolist artists. Nature's Mirror, and the exhibition it accompanies, traces these landmark developments with a rich array of seldom-seen works. Nature's Mirror presents its collection of prints and drawings in chronological order, exploring the evolving dialogue between subjective experience and the external world from the Renaissance through the First World War. Essays by American and Belgian specialists examine artists within the regional, political, and industrial contexts that strongly influenced them. Featuring more than one hundred works, many from the leading private collection of Belgian art in America, the Hearn Family Trust, Nature's Mirror explores the evolution of Belgian art in this fruitful period with remarkable lucidity and detail.